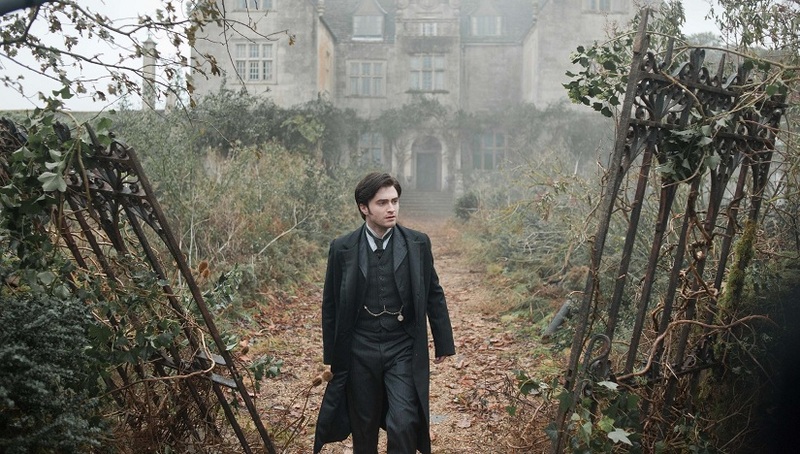 A Gothic Horror of the finest order, The Woman In Black marks both a brave risk well taken by Daniel Radcliffe and a barnstormingly successful move to mainstream Horror by Eden Lake's James Watkins. Whilst the film relies on sudden noises and mysterious appearances for its scares, the atmosphere that pervades throughout - the sense of grey creeping horror, maintained by Watkins - makes the stock scares enjoyable. There's perhaps not a lot here that you haven't seen before but when it's presented as well as this, do you really care? Radcliffe, moving straight from Harry Potter, on to Horror - a brave move along a road less travelled by his peers - must have been supremely chuffed when this part landed on his desk. It is perhaps as far away from Harry as he could hope to get at this point. Arthur Kipps is pallid and nervous, a widower, with a son and a upstanding job as a lawyer. He does, it is established early on, see ghosts from time-to-time, and his career path is approaching the point of inertia one might expect to happen at some point close to the mid-thirties. If this sounds a bit unbelievable for the man who was a boy wizard then it is but he is ably helped along by Jane Goldman's script, which is near-silent for long periods, and outstanding support from Ciarán Hinds, whose aristocrat could have been a stock antagonist but is instead something much more. Watkins' film too is not one afraid to shock. The opening scene, featuring the three girls from the trailer, is unexpected and deeply troubling, introducing the concept behind The Woman, which is further explained as the narrative develops. Several parts of the imagery really push the boundaries of acceptability in a 12A film and the middle third, which takes place entirely in Eel Marsh House, with only Kipps present and no dialogue to speak of, is nothing short of terrifying. I am not ashamed to admit that I watched parts of it with my hands over my eyes. Sometimes, I even opened my fingers. If there's complaint beyond the source of a lot of the scares then it perhaps rests at the feet of the final third, which sees Watkins and Goldman apparently clambering to get everything finished as quickly as possible. Scenes start to move faster, scares start to thin out and there's a mad dash for the finale. When it comes, you can perhaps see the logic behind the director falling over himself to keep the audience moving towards it but still, the pervasive atmosphere of the film is tested by the change of pace, which, with a total runtime of ninety-five minutes, is otherwise excellent. The haunted house film you've been waiting for. Not especially original and not tremendously scary, but there are a few pleasurable jolts of fear, some shiver-down-your-spine moodiness and it doesn’t overstay its welcome for too long. Nice write-up. The runtime is a major plus point. Agree its not that original but I thought it was scary enough and it definitely has the moodiness.